Most of the time I feature products that are sold on Chinese online stores, because it’s either the only way, or the cheaper way to purchase the products. However, it’s not always easy to decide which Chinese e-retailer to select, and to avoid potential pitfalls with the sellers, and/or at home when you receive the products and get charged all sort of taxes. In this post, I’ll go through a list of Chinese online stores, the ones I personally use, and others, and then provide a guide with a series of tips and recommendations to hopefully help you shop with minimal worries. I’ll only cover retail stores, and skip wholesale sites such as Alibaba. E-retailers (B2C) – In this case, you buy directly from the retailer which collects payment, and handles shipping and support. Examples are DealExtreme and GeekBuying. Seller Portals – The website then acts as a third party for transactions between two parties: a seller (individual or small business) and a buyer. Examples are Ebay and Aliexpress. If you purchase any item from an e-retailers, you’re likely to have the same level of support and overall experience next time you purchase a product. But if you buy from Ebay or Aliexpress for instance, you may want to check the seller ratings and other buyers’ feedback before committing to a purchase. There tends to be a wider range of products and cheaper prices on sellers portals. There’s another type of sites using the dropshipping service of some e-retailers. They are just a website to allow people to purchase, but all product shipping and handling is done by the original e-retailer. I believe none of the sites listed below are dropshipping websites. For full disclosure, please note that some of the links below will be affiliate links either manually, or via auto-generated links through a service called skimlinks. Dealextreme – I do most of my purchases via dx.com, mostly because I’ve gotten used to it, the price are OK (most of the time), they accept Paypal, and I clearly understand their various policies in terms of shipping, and returns. If you have a reasonable proof a product is defective, or not as described, they’ll either provide a refund (as dx points), or pay for return shipping (amount limited) and refund later.. I’ll explain a bit more in other sections of the post. Ebay – OK. I reckon Ebay is not exactly a Chinese website, but most of the purchases I make there come from China or Hong Kong. If something is not available or too expensive on DealExtreme, I fall back on Ebay, mostly because they accept Paypal, which is my favorite means of payment. – It’s a seller portal with a large number of sellers, and an amazing choice of products. If I can’t get what I need from Ebay or Dx.com, I’ll use Aliexpress where I’m pretty sure to find anything. It would probably be my first choice, if they accepted Paypal. You have to be especially careful however with some tricks sellers are using to deceive prospective buyers. More details below. Pandawill (Update 2019: Now closed)- This e-retailer is relatively popular and sells gadgets, clothes, and (cheap) jewelry. I’ve purchased once, and I did not have any issues with their service or product. GeekBuying – I receive most of my samples for review from GeekBuying, and although I’ve never purchased from them, they seem to be very popular, and trusted by the community. One reason could be because they try to release firmware for their devices regularly, and they are involved in the community. They mainly sell gadgets, but I’ve recently seen some (cheap) jewelry too. W2COMP – The company fully specializes in electronics gadgets, and they’ve sent me a sample in the past. I could also them get products reviewed by Liliputing a few times. They do not appear to be that popular, but I haven’t heard much bad reports about them. I also never purchased from them. Over the years, I’ve been tipped for several products by my readers from other sites, all e-retailers, including banggood.com, buyincoins, focalprice.com, lightake.com. tinydeal.com, chinavasion.com and ahappydeal.com. I’ve never used them before, so I can’t comment on their reliability or trustworthiness. If people can comment about their experience with these it could be useful to others. Of course there are even more, probably lesser known, sites where you can buy the latest gadgets. You could find more via Gizchina directory, or a blog post on Obscure Handhelds. Before you shop on a website, you’ll probably want to know if it is trustworthy. One way is to use Google to find out if people mention scams, bad customer services and so on. For every sites you’ll find some negative reviews, as you can’t please anyone. But do not let these scare, and try to find overall what people think about the sites, products and service. Another, possibly faster, way is check the sellers on Resellerratings and compare various sites. Once you’re happy with the site, but you’re using a seller portal you’ll need to check the seller ratings on the site itself (e.g. Ebay/Aliexpress). After each buyer receive a parcel, they’ll normally give a mark between 1 and 5 stars depending on the shipping speed, if the product matches the description and so on. If a seller a no feedback, it does not mean they are bad, but you’re taking more risk than with a seller with 1,000 reviews and a 99% approval rating. Even though Aliexpress or Ebay can act as a third party to resolve cases, it’s always better not to get bad service/products, because of time wasted, and return shipping may be prohibitively expensive. If you want to be thorough, you can also check the product itself before purchase, checking for blog reviews, seller reviews on Amazon, and so on. Of course, if the product is really new, you’ll have to take a change, and/or wait for reviews. Another relatively important point is to understand the terms and conditions of the websites. There are not always clearly stated, and most people don’t like to go through pages of legalese, so only experience can help here. For example, in the case of DealExtreme, I’ve come understand they don’t use a tracking number for packages less than $15. And since packages without tracking tend to get lost – It happened to me twice -, I now always tries to make order over $15 to get a tracking code. If a package without tracking never shows up, DealExtreme will provide DX credits, but you’ll need to wait over 2 or 3 months before making the request for refund, which is a pain. When you order multiple items, some may be out of stock, so they’ll do a partial shipment. In case you’ll get a tracking code if the value is over $6. Understanding how the company handles return shipping is also important. With DealExtreme, for package below $12 or $15 (can’t remember) which are shown not to work, the company will issue a refund in DX credits, and for parcels with higher values will cover the costs for return shipping with tracking for up to 10% of the value. Of course, this is now always enough (I never had to tried), and you may have to pay a little extra for return shipping. Once I had to return a product which did not work as expected, and bought from Ebay, and I had to pay for shipping myself. Most sites will accept Credit Card (Visa/Mastercard), many will accept Paypal, and other online payment systems such as QIWI, Webmoney, Checkout.com, as well as Western Union. The mean of payment is most probably just a matter of preference, unless maybe with Western Union where it may be more difficult to get a refund (TBC). If you want to save a few more bucks before order, look for coupons on Google, or wait for regular promotional events where you can get very large discounts, albeit in limited quantities (first come, first served). China Post – This is sometimes the cheapest, but one of the slowest. It takes about 4 weeks to reach Thailand (where I’m based). Also make sure with the seller there’s a tracking number to avoid losses. Hong Kong Post – More reliable and faster than China Post. It takes about 3 weeks to reach Thailand. Singapore Post – It’s my preferred service, as it takes as little as 10 days to get the parcel after shipping. Sweden/Swiss Post – If you’re based in Europe these may be fine. But as I’m based in Asia, it takes an awful lot of time (6 weeks in my experience) to get the parcel. I believe there’s some kind of charter that sends to parcel to Sweden or Switzerland, and they are send forward to whatever destination. Courier – Fedex, DHL, UPS – More expensive, but usually very fast (2 to 4 days). With standard mail, the delivery time depends on the destination too. I think I’ve read some destination such as Russia or South America can take pretty long time, i.e. over 6 weeks. In you are in a hurry, courier are nice, but bear in mind, the parcel is more likely to go through customs inspection, so you’ll have to pay some import duty, plus a “custom handling” charge from the courier company. In Thailand, I usually pay 200 Baht (about $6) for this service. Standard mail price is almost always included in the price, courier services are obviously extra, except potentially during promotions. If you think you know exactly what you’re going to pay for your product right after your order, you may be for a nasty surprise when the parcel comes, as the postman or courier company may come with a bill asking you to pay for custom duties, VAT, and other taxes kindly invented by your government. There’s however a not-so-dark secret… Many Chinese resellers will simply send the parcel with a low declared value, or as a gift with a small value, in order to avoid custom duties. Sometimes they’ll even ask you what they should write… This looks completely illegal, but since the amounts involved are very low, and persecution of the seller virtually impossible, there are not been any crackdown on this practice. Please note that customs may also decide the declared value is too low, re-evaluate it, and charge you import duties and VAT. Specifications are often wrong – In many products, there will be mistake in the specifications. Maybe that product with 2GB RAM with come with 1GB RAM, the product ends up with a different processors and so on. Good sites will generally acknowledge their error, and offer a partial refund, or ask you to return the product, and cover the cost. With Ebay and Aliexpress, this may be hit or miss, as it depends on the seller and the people in charge of resolving issues (from ebay/aliexpress). No stock – This has happened frequently with DealExtreme in the past year. Your order a few products, and a week later they contact you saying some of them are not in stock. If this is highly annoying, but you can easily get a partial refund or your Paypal and/or Credit card, or wait longer. Confusing quantities – Some sellers on Aliexpress have an original method to declare quantities. For example if they sell a media player with an extra remote, they’ll indicate two items, leaving you the impression you can get two media players, at a very good price. Common sense should prevail here, as if something is too cheap to be true, it probably is. 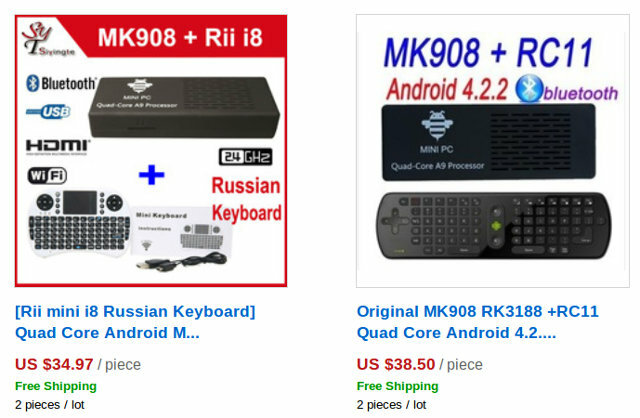 Here are two examples with MK908 mini PC and RF remote. Fake discounts – Other sites, such as GeekBuying, will show massive discount to all of their products, but give a massively inflated normal price. Don’t fall for it, and check the price of the item on other sites to double check. Direct Lies / Broken Promises – In many cases, you’ll chat with the seller before order, or with support. And they may just lie to you, or make promises just to break them later. This happened to me just once, when I ordered two pairs of shoes on Aliexpress from the same seller, and with shipping included. In order to avoid custom duties, I asked them to send two separate parcels (to be below the $30 limit, and avoid paying (100% duty), which they agreed with, but the guy who packed decided it was not necessary…. It was pretty annoying, but luckily I did not end up paying any duties. I hope I did not scare you off with that long post. But if you’re getting started the key points is to select reputable shops and/or sellers (DealExtreme, GeekBuying, sellers with lots of good reviews on Ebay/Aliexpress), set your expectation in terms of shipping time (one month is normal), be aware of typical tricks, and start with a small amount, if you are worried about custom duties, and not sure what to expect on this front. Most of the time, I’ve have good experience with my Chinese e-shopping adventures. Comments are more than welcome about your own experiences, remarks, and questions. Is there any better way to track shipments from China? For DHL last year I used http://www.boxoh.com/ and they had an RSS feed which was very convenient. Re buyincoins, while the reviews are fake, in other ways they’re not bad: product quality is as good as the other comparable shops, prices generally lower (can be much lower), shipping faster & they’ve been pretty good about returns on some (small) items I’ve had trouble with. I think Focalprice is comparable with DX in most ways, but maybe a little cheaper. They don’t write (aka copy/paste) their own reviews like buyincoins, but, if they don’t like yours it never appears. (ie the published reviews are hopelessly biased). I wish I had known DealXxtreme’s $15 rule. I made an $11 and a $21 purchase on the same day (because I needed to use different payment methods for each), March 13. The $21 purchase (an air mouse — which I love) came in about two weeks. The $11 purchase has yet to arrive; it’s very frustrating. I guess you get what you (don’t) pay for, though. Also, reading your comments about getting stuff shipped to Thailand, posts elsewhere about the Chromecast’s poor international availability, etc, I feel a bit spoiled living in the US. It seems like we get just about everything here — and about 75% of it is on Amazon and will arrive in two or three days! Banggood: considered reliable, personal experience: 100% delivery in max. 10 days. buyincoins: considered reliable, no personal experience. I always laugh at the way GeekBuying show their “discounted” price. If the difference between the regular price and the discounted price is only a few bucks then I would definitely believe that. But they often blow the regular price up too hard, lol. And also on AliExpress you should be aware the type of deal that is too good to be true, especially for relatively new or least reviewed seller. 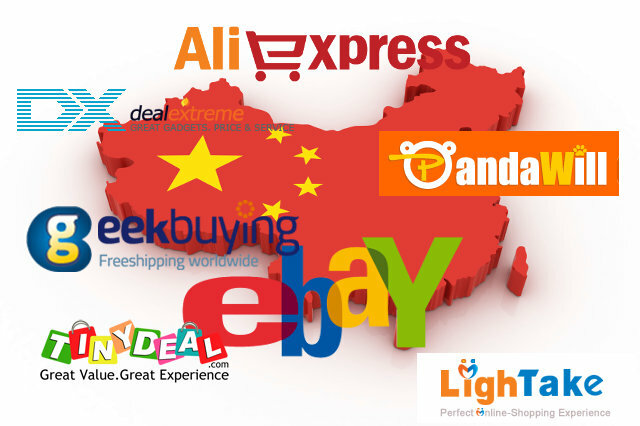 I have bought successfully with E-retailers (B2C) as Seeed Studio.com or Seller Portals as Aliexpress (an Alibaba.com company), Focalprice, GeekBuying, DHgate, GoodLuckBuy, Easy-TaoBao.com and a lot from Ebay…switching from ones to others for best price on interested products or just for lots (quantities). Where there’s no PayPal always there is VISA/Mastercard. Obviously always checking the right product’s description. I can confirm that Buyincoins is good, I bought 4 times from them, I usually find something on DX and then search Buyincoins if they have it, if they do, it’s usually cheaper. Also I would like to mention LinkDelight.com which is great for camera equipment, I bought from them a 200$ tripod and it went well. I bought from them a 200$ tripod and it went well. 200$ without paying taxes or duties on imported good ? I wish ‘Eric’ at GeekBuying.com will respond. I think if the price for an xGB card is within about 20% of the price on dx & similar stores, it’ll be genuine. Also the sellers will generally tell you if you ask them…. * China Post – http://intmail.183.com.cn/icc-itemstatusen.jsp (Probably not the official website). And after it has left the country of origin, I switch to the country of destination tracking website. For reference, as I’m based in Thailand, I use http://track.thailandpost.com/trackinternet/Default.aspx?lang=en. They also have an Android app (https://play.google.com/store/apps/details?id=com.trackandtrace.lazylist), which may be convenient as you automatically receive alerts. If you’re in Europe then a key reason why many items cannot be bought locally is that the products have not been CE tested and do not have the European CE certificate. This means they’ve not been tested for safety and are illegal to import into Europe. A bit like under-declaring value most countries do not check for valid CE, but some do. The lack of CE cert prevents legitimate European retailers from importing products for resale. If you want a higher quality product tested to European safety standards only buy from European retailers. The siatuation is probably the same in the United States but with FCC certification. For you. If you have any problem about our service, shipping,product, feel free to contact me! We are always here, listening to our customers suggestions and improve! I can add only fastcardtech.com that I know, but I have not bought anything from them. I find also focalprice ok. and have bought from dx.com, w2comp.com and aliexpress very succesfully, until now. But there were very handfull to have some search engine to find products between those sites! Pandawill.com has better/newer and cheaper phones than DX. Really, don’t buy phones from DX. (Almost) everything else – yes. I agree with Singapore Post being better than HK Post, and China Post being the slowest. You forgot “far more expensive”. The way I see it, I could spend 600$ for a quality tested Samsung/Apple phone or I could get a phone with similar hardware from China for $200. Also seeedstudio.com is good for development boards at not-inflated prices (an example of inflated prices: Farnell). The Postal system / customs also ban/restrict lasers / knifes / magnets also also batteries. Though any of these might pass inspection. The batteries depend on how they’re packaged / size / type etc. And most importantly on how much every country chooses to enforce rather silly rules. Ship by China Post (or shenzhen post, guangdong post or another chinese “post”) is a big risk to lose your packages. Choose Swiss post, Singapore post, Netherland post (for phones), HK post… but, please, never China post (long experience talking). I bought my phone from DX, and it had the cheapest price. True that’s not the norm (DX begin cheaper than Aliexpress for example), but I guess you just need to shop around before you buy. Even if you use registered mail? I’ve just had two parcels that got lost with China Post, but they were too cheap for the sender to use registered mail. Thanks. Of course, I’m open to cooperation. I’ve just news got someone who received a device advertised with 2GB RAM, but it ended only having 1 GB RAM. That was on Aliexpress, but he asked for a partial refund before confirming reception I believe, and you could get $7 paid to his Paypal account out of a $40 device, after some haggling. So remember if you don’t exactly get what was promised, you can always try to some of your money back. Ive purchased from dx, pandawill, focalprice, tinydeal, buyincoins, tmart, banggood and geekbuying. Almost 40 purchases in total. I´ve received defective items 5 times from dx, focalprice, tinydeal and pandawill. I resolved the issues with those sites (usually by refunds or coupons) except for Pandawill. Their customer service is very annoying. They didn´t recognised the problems even after I gave them plenty of proofs. That was the only time I had to use paypal as a mediator. I DON´T RECOMMEND PANDAWILL AT ALL. I was talking about registered mail, if use normal post the disaster can be bigger. China post lost 30~40 packages in 2012 christmas from my company, also someone more after that. Solution?, change to Swiss post, Sweden post, HK post… now maybe 2-3 packages are lost PER YEAR. Also for those who are living in Argentina, no matter which company you choose, local customs open boxes, steal goods and even sometimes put inside old things. Some chinese shops even don’t want sell to Argentina because this. GeekBuying is normally a trusted vendor. I’m not sure their customer service staff works during the week-end however, so give it a at least one more day for them to reply. i want to use gearbest but their payment option is a problem. i dont have access to paypal so i find it difficult to shop from there. so they should try and accept other cards outside paypal. Is there any Price comparison site for online Chinese retail websites, for International users? Try http://www.parcelmonitor.com – its good because it covers a lot of Chinese and other carriers and I don’t need to search for their specific websites..
STAY AWAY FROM TOMTOP.COM. Will write the reasons later!